The market for traditional disaster recovery systems (DR) has witnessed vast changes over the past decade. The advent and rising adoption of cloud-based disaster recovery services (also formally referred to disaster recovery as-a-service or DRaaS) has transformed the market and has significantly resulted in the replacement of traditional DR systems with the former. The drastic change in the growth dynamics of the traditional DR market has compelled many leading players in this field to make the move to cloud-based DR systems and services. This has introduced a large number of companies in the market, significantly intensifying competition as well as providing consumers a vast number of options to choose from. The market is expected to exhibit a remarkable 35.7% CAGR over the period between 2016 and 2024, states Transparency Market Research. If the prediction holds true, the market, which had a valuation of US$1.29 bn in 2015, is expected to rise to US$21.55 bn by 2024, in terms of revenue. On the basis of key applications of DRaaS, the global DRaaS market has been segmented into banking, financial services and insurance (BFSI), government, IT and telecom, media and entertainment, manufacturing and logistics, and education. Of these, the government sector contributed the dominant share of 18.3% of the overall market in 2015. The vast demand for DRaaS solutions and services in the sector is attributed to the increased level of digitization across a number of processes and operations and the resultant rise in need for backing up critical public and private data. The global DRaaS market also earns a sizeable share in its revenues owing to applications across the IT and telecom sector, which is currently witnessing expansion at a high pace owing to the high number of startups and new online-based services entering the online retail market. Most IT and telecom companies have their data/business operations in the cloud and require an efficient disaster recovery plan to ensure smooth continuity of business. Globally, North America dominated the global DRaaS market in terms of revenue, accounting for more than 34.0% in 2015 and is expected to continue dominance over the forecast period as well. The key force impelling the DRaaS market in North America is the presence of a large number of SMEs seeking affordable DRaaS solution and services. In the U.S., government departments and the public sector are also deploying DRaaS services to gain cost benefits. The presence of a large number of vendors and the resultant rise in the number of cost competitive options, for enterprises to choose from, has also helped bolster the growth prospects of the North America market. Asia Pacific is expected to be the regional market with the most promising growth rate over the forecast period. Customized DRaaS solutions offered by multiple vendors/service providers are key to the excellent growth prospects of the DRaaS market in the region. An increasing number of companies in the region are experimenting with cloud-based disaster recovery solutions as technology service providers are developing new offerings designed to fit the specifications and budgets of customers. Government initiatives and policies to promote business-friendly environment are encouraging multinational firms to invest in the region. This is likely to boost demand for DRaaS solutions. E-commerce companies in the region are expanding significantly. This, coupled with strong recovery of the telecommunication segment and growth in the manufacturing and the government segments, is estimated to continue to drive the Asia Pacific DRaaS market over the forecast period. Some of the key players operating in the global DRaaS market are IBM Corp., VMWare, Inc., Cisco Systems, Inc., Symantec Corporation, Amazon Web Services, and Commvault. Disaster Recovery as a Service (DRaaS) is the duplication of physical or virtual servers by a third-party to provide failover in the event of a man-made or natural data failure. Data has become one of the primary concerns for organizations. In the present scenario, the world is running on the basis of data, across all sectors. DRaaS is primary implemented to protect resources and data from disruption in the event of disaster. DRaaS helps in business continuity for organizations as it provide a total system backup caused by system failure. DRaaS is often offered in conjunction with a disaster recovery plan. DRaaS find its application in a number of industries including BFSI, Retail, Government and Education, IT and Telecom, Media and Entertainment, Manufacturing and Logistics, among others. Among the aforementioned segments, DRaaS is mainly used in the government sector. It hold the largest market share among the segments. Based on the deployment model the DRaaS market is segmented into To Cloud DRaaS, In Cloud DRaaS, and From Cloud DRaaS. In terms of company size, the global DRaaS market is segregated into small companies, mid-sized companies and large companies. Mid-sized companies held the largest market share in 2015, with the increasing popularity of cloud based DRaaS, this market segment is forecast to grow at a significant rate during the forecast period 2016 to 2024. Additionally the, global DRaaS market is divided into cloud type which includes private cloud, public cloud and hybrid cloud. In terms of service providers, the global DRaaS market is bifurcated into cloud service providers (CSP), managed service providers (MSP) and telecom & communication service provider. Furthermore, the DRaaS market has the following divisions on the basis of service type – Real Time Protection, Backup, and Professional services. 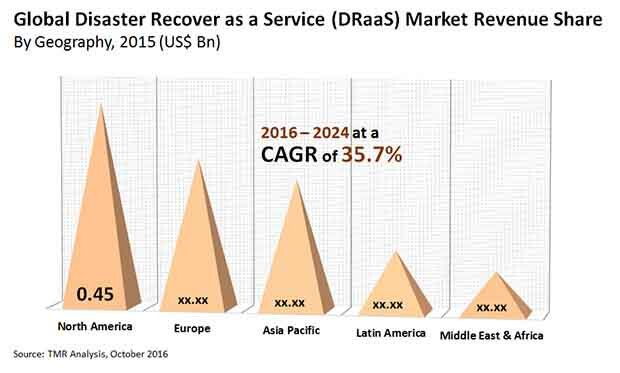 DRaaS market has huge scope and opportunity in the emerging markets of Asia Pacific and Rest of the world (RoW). Countries such as China, Japan, India and Brazil, among others are the major DRaaS market falling under the Asia Pacific and RoW. Asia Pacific region is home to the world’s important emerging economies - India and China. The major drivers driving the global DRaaS market includes rise in adoption of virtualization technologies, and increasing investments in disruptive cloud technologies, among others. As the cost of ownership of data recovery services is increasing, organizations are shifting towards virtualization and cloud. This is due to the fact that, these technologies are safe, easy to use, cost effective, and can be managed easily. The competitive profiling of the key players in the global DRaaS market across four broad geographic regions is included in the study. These include different business strategies adopted by the leading players and their recent developments as in the field of DRaaS. The value chain analysis of the market has been provided in the report, in order to offer a deep insight of global DRaaS market. A comprehensive analysis of the market dynamics that is inclusive of market drivers, restraints and opportunities is included in the purview of the report. Market dynamics are the factors which impact the market growth, thereby helping to understand the ongoing trends of the global market. Therefore, the report provides the forecast of the global market for the period from 2016 to 2024, along with offering an inclusive study of the DRaaS market. Some of the major players in the global DRaaS market include Oracle Corporation, Microsoft Corporation (Washington, United States) , IBM Corp. (New York, U.S.), VMWare, Inc., (California, U.S.), Cisco Systems, Inc., (California, U.S.), Symantec Corporation (California, U.S.), Amazon Web Services (Washington, U.S.), and Commvault (New Jersey, U.S.) among others.